3.6 out of 5 based on 21 bloggers and 4 commenters. 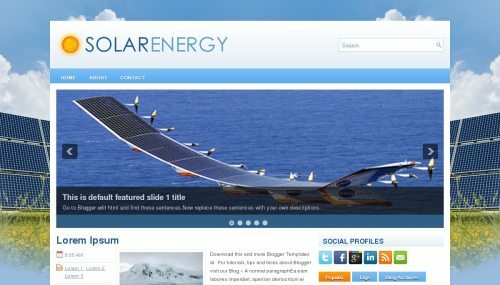 SolarEnergy is a free blogger template adapted from WordPress with 2 columns, right sidebar, slider, social bookmarking icons, posts thumbnails and tabs. Excellent template for blogs about education, nature or science. Great template. the Solar Plane is awesome! This template is lookinh awesome!